In the case of joining three tables table, 1 relates to table 2 and then table 2 relates to table 3. If you look at closely you find that table 2 is a joining table which contains primary key from both table 1 and table 2. As I said it can be extremely confusing to understand join of three or more tables. I have found that understanding table relationship as the primary key and foreign key helps to alleviate confusion than the classical matching row paradigm. 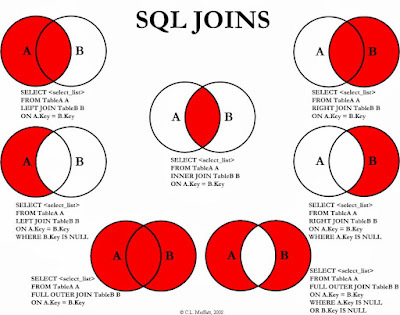 SQL Join is also a very popular topic in SQL interviews and there are always been some questions from Joins, like the difference between INNER and OUTER JOIN, SQL query with JOIN e.g. Employee Department relationship and Difference between LEFT and RIGHT OUTER JOIN etc. In short, this is one of the most important topics in SQL both from experience and interview point of view. Btw, the only way to master SQL join is doing as much exercise as possible. If you could solve most of SQL puzzles from Joe Celko's classic book, SQL Puzzles, and Answers, 2nd edition, you will more confident about dealing with SQL joins, whether it could be two, three or four tables. We first join table 1 and table 2 which produce a temporary table with combined data from table1 and table2, which is then joined to table3. This formula can be extended to more than 3 tables to N tables, You just need to make sure that SQL query should have N-1 join statement in order to join N tables. like for joining two tables we require 1 join statement and for joining 3 tables we need 2 join statement. In order to better understand joining of 3 tables in SQL query let's see an example. Consider the popular example of Employee and Department schema. In our case, we have used a link table called Register which links or relate both Employee to Department. The primary key of Employee table (emp_id) is a foreign key in Register and similarly, primary key of Department table (dept_id) is a foreign key in Register table. In order to write an SQL query to print employee name and department name alongside we need to join 3 tables. First JOIN statement will join Employee and Register and create a temporary table which will have dept_id as another column. Now second JOIN statement will join this temp table with Department table on dept_id to get the desired result. Here is the complete SELECT SQL query example to join 3 tables and it can be extended to join more than 3 or N tables. If you want to understand it even better than try joining tables step by step. So instead of joining 3 tables in one go, first join 2 tables and see how the result table will look like. That’s all on How to join three tables in one SQL query in the relational database. By the way, in this SQL JOIN Example, we have used ANSI SQL and it will work in another relational database as well e.g. Oracle, SQL Server, Sybase, PostgreSQL etc. Let us know if you face any issue while running this 3 table JOIN query in any other database. Thanks for reading this article so far, if you like this article then please share with your friends and colleagues. If you have any questions, suggestions or doubt then please drop a comment and I'll try to answer your question. WHY MY SQL SHOW ONLY COLUMN AND IT DOESN'T SHOW ROW IN TABLE? I would look for employees who do not belong to the sales department, what will be the query? I love this example. Just one thing must be informed to the reader. Remember that when we JOIN any two tables together on any condition the resultant table contains ALL THE COLUMNs HEADINGS of the two table. KEEP this thing clear it will solve the problem when JOIN works with three or more tables. Very well explained. Thank you. I was looking for a solution on how to join 3 tables and the explanations on other websites were not clear. This one is excellent and solved my problem. @Anonymous, what error did you get? Can you please post here? how to join two or more different tables in same columns? @Unknonwn, In order to join table you must have same keys e.g. primary key and foreign key, if you have that than you can easily join them following syntax given in this tutorial e.g. You can use L2.id or L1.id on second join syntanx depending upon your requirement. Remember, when we join two tables a third temporary table is created which contains all columns of both tables, so you are free to use key from any of the table. Be careful, if a product is not associated to any category then the JOIN will discard it. If a product is not associated to any accessory, then it will be discarded. JOIN will silently remove a row if the "ON" condition is not fulfilled for that specific row. Use "LEFT JOIN" instead of "JOIN" to see these rows (select all the columns that are used on any of the ON conditions, the rows with NULL values are the ones that are failing one or more ON conditions depending on which column in NULL). I was always using below method for multiple join table, which quite different from all you all talking. Will my statement going to have serious performance issue? Please point me out if I am doing wrong. Thank you so much. This is the solution that worked for my needs. I had been looking for this solution for weeks. Thank you. Apart from the mysql join types you have mentioned, there is also union. Union in MySQL is used to unite multiple columns from different tables into a single column in MySQL.